Modern hinged-style band is detailed in delicate, antique gold-tone filigree and accented with shimmering colored enameled metal with rhinestone accents in an enchanting flower design. 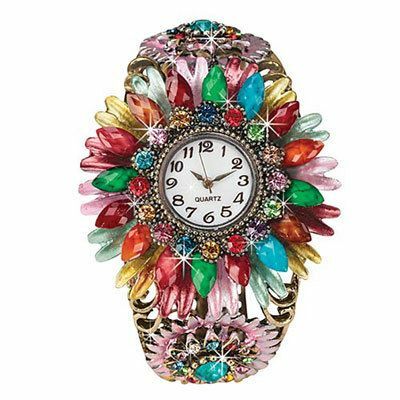 Our Dazzling Floral Watch is one size fits most. 2"w. Hurry! Quantities are limited! The watch is beautiful and looks great. It fits well and is a wonderful accessory to have. It also is a great-looking bracelet. I've worn it several times. I did however have a hard time setting the watch to the correct time but that wasn't a big deal. This beautiful watch goes so well with any outfit. I love it! I love, love, love this watch. I have one and have given 3 as gifts to very happy recipients! This is more than a bargain, it matches everything in my wardrobe anytime I chose to wear it! GREAT BUY! I love the look of this. It is unique! !